Add 2 Year Extended Warranty - $204.00 ? 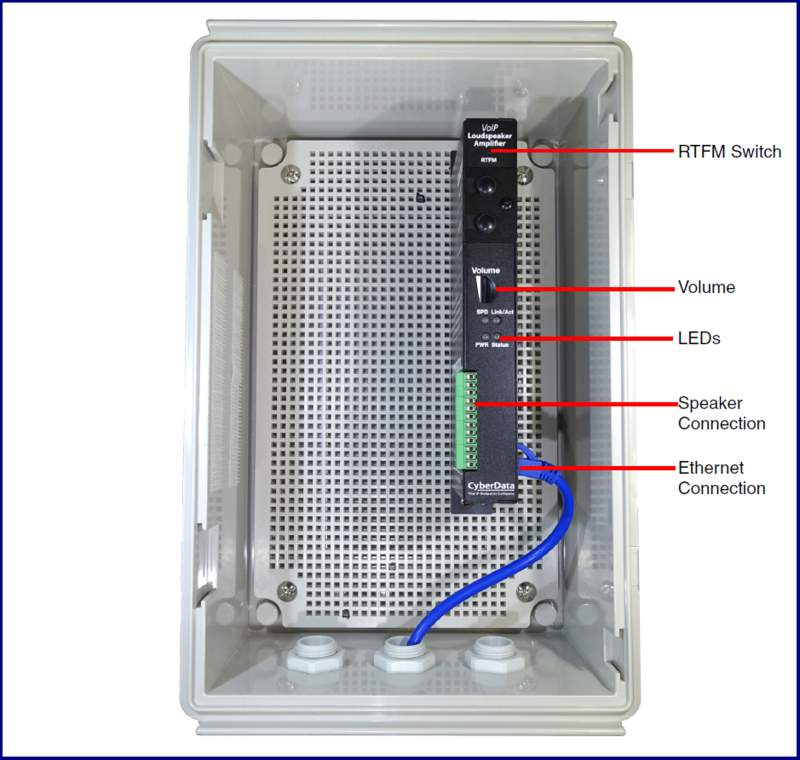 The SIP Loudspeaker Amplifier is a Power-over-Ethernet (802.3at) Voice-Over-Internet-Protocol (VoIP) paging device and loud ringer for use in places that need loud paging. It provides an easy method for implementing an IP-based overhead paging system for your existing or new VoIP Phone system. 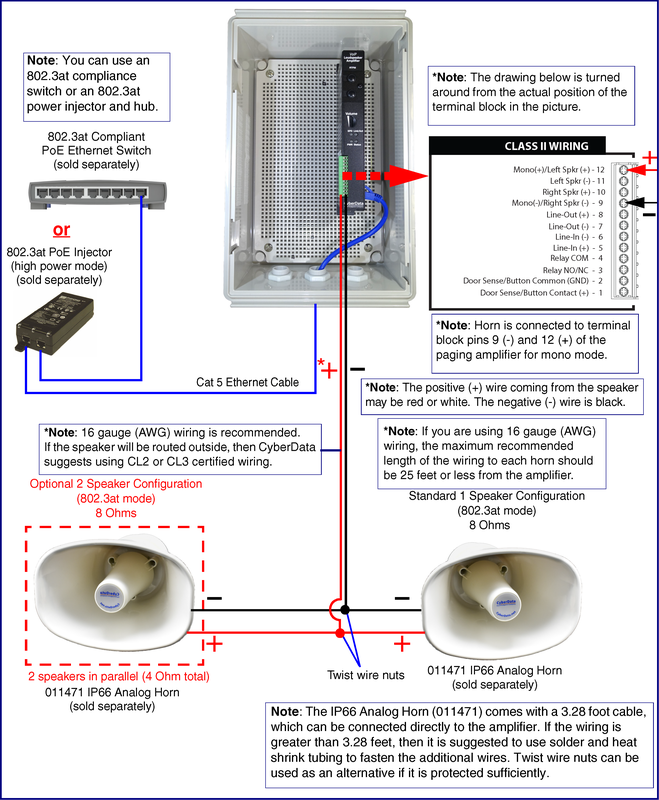 The SIP Loudspeaker Amplifier can have one or two 011471 IP66 Analog Horns attached. See more details in the Operations Guide or under the Installation tab above. 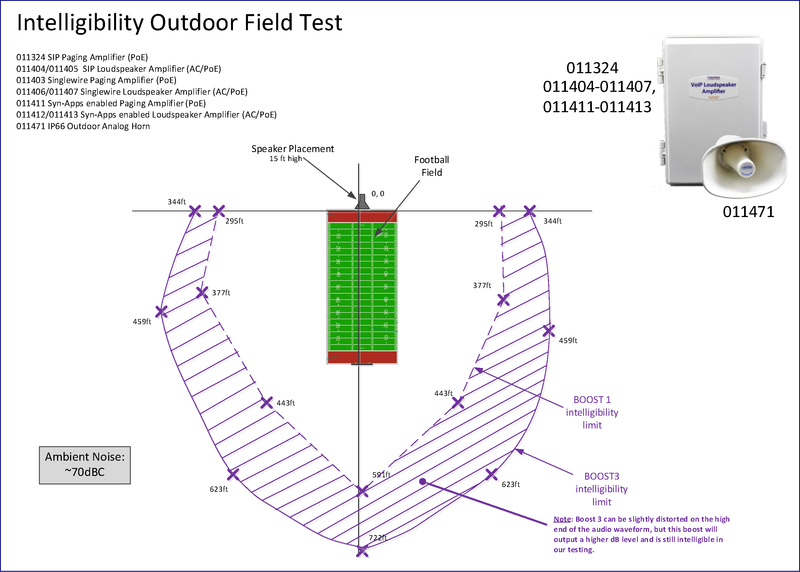 **Dimensions are measured from the perspective of the product being upright with the front of the product facing you. What is the coverage of this device? 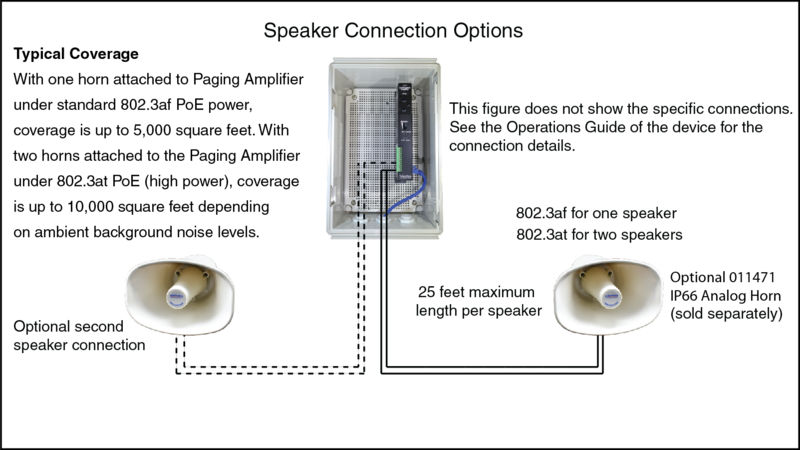 When attached to a standard 802.3af port on a PoE switch, you can only attach one horn (8 ohm 30-40 watt rated) with no more than 25 ft. of 16 gauge speaker wire and will cover about 5,000+ sqft depending on ambient background noise. 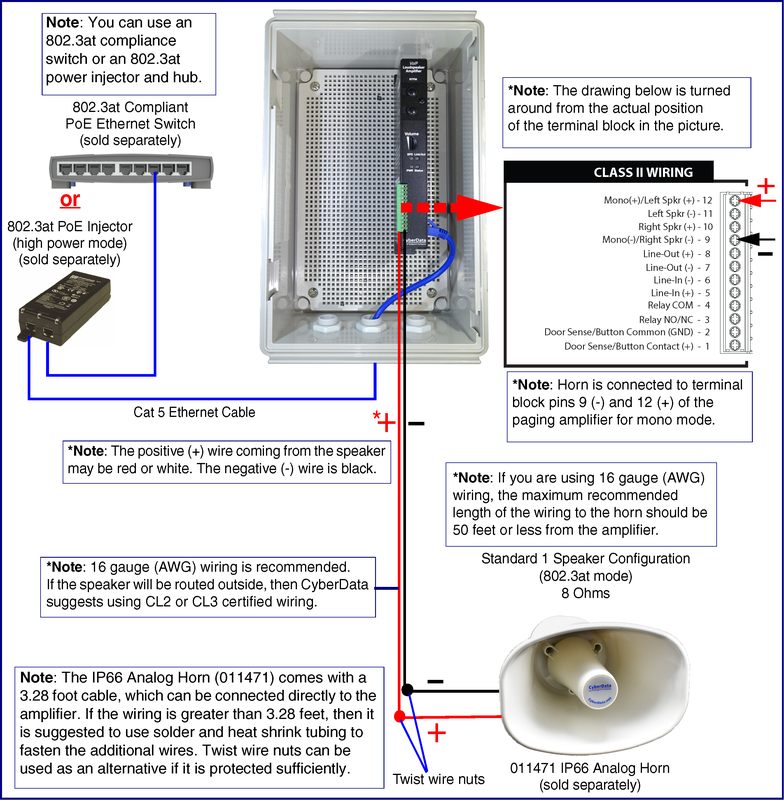 When attached to a standard 802.3at (high power mode) port on a PoE switch, you can attach two horns (8 ohm 30-40 watt rated) with no more than 13 ft. of 16 gauge speaker wire to each horn and will cover about 10,000+ sqft depending on ambient background noise. Check to see if your current firmware is the latest version before attempting to update. Download the latest version firmware which includes the Update Firmware Utility. To upload the firmware from your PC, see your Operations Guide. How many horns can be connected to an amplifier? 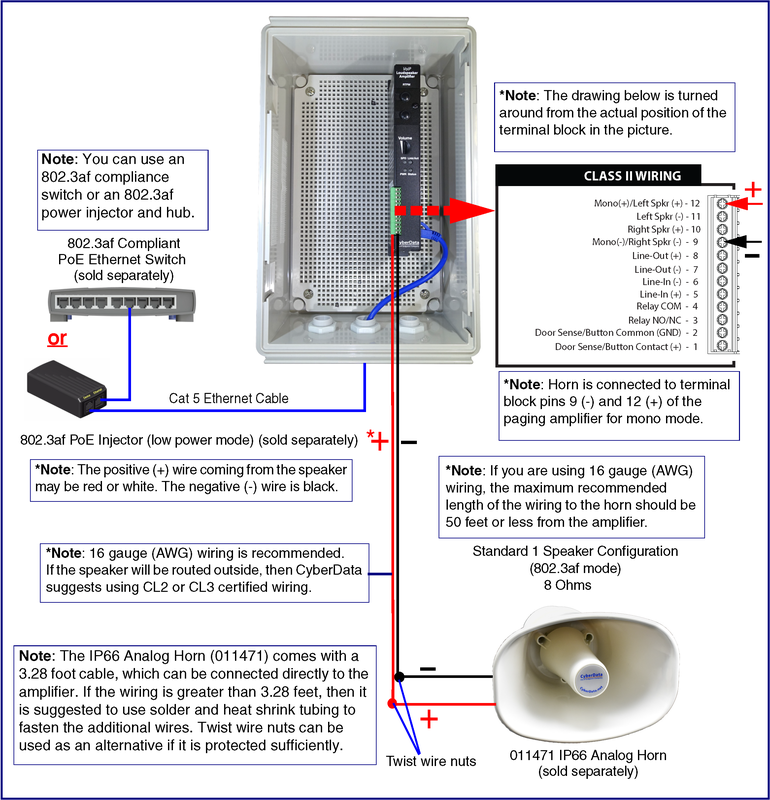 CyberData's VoIP Paging Amplifier supports the following outputs: One 8-ohm speaker, 8 watts. One 8-ohm speaker with external PoE power injector (CyberData PN 010867), 10 watts. Two 8-ohm speaker in parallel with external PoE power injector (CyberData PN 010867), 16 watts. Are your speakers compliant with RFC 3261? Yes, our speakers are compliant with RFC 3261, but not every SIP extension is fully supported, such as extensions for certain phone features that our speakers do not require. Do your speakers support other protocols? Our speakers are SIP endpoints that use the SIP protocol in RFC 3261. Depending on the business case, we will consider custom applications using other protocols. Please contact CyberData Support for inquiries concerning other protocols. 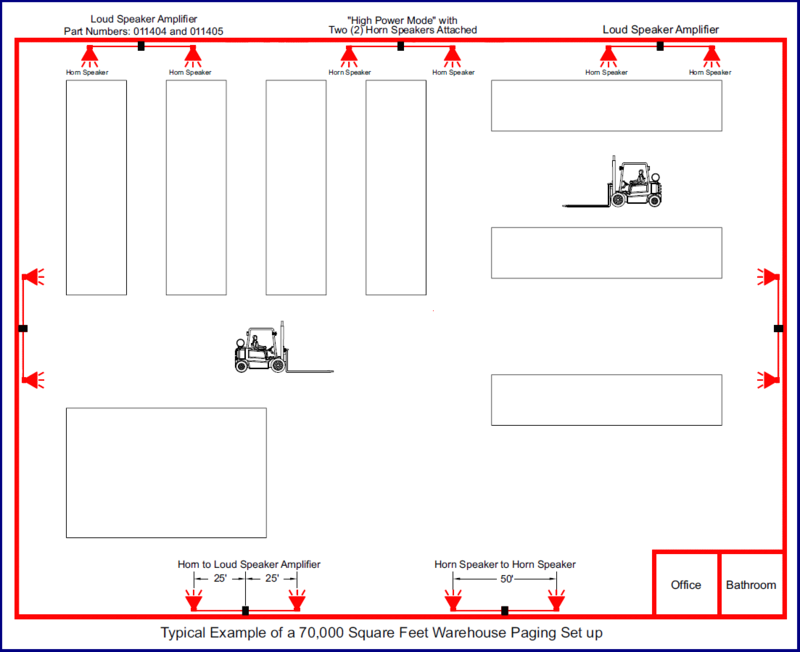 Our IP-PBX server is RFC 3261 compliant in that it can register other SIP endpoints, so how do I create multiple paging zones using your speakers? Our speakers do not create multiple zones as this is a feature (SIP extension) of the IP-PBX server. If your IP-PBX server does not support this SIP extension, you can use our Paging Server product to create multiple zones with our speaker. Which IP-PBX servers do your speakers interoperate with? Our speakers interoperate with the IP-PBX servers specified in our Support Knowledgebase article, Connecting to Compatible IP-PBX Servers. I hooked up your speakers using Asterisk and they play audio individually but why don?t they play in a paging group (zone)? (1) Make sure you have installed and loaded a timing source such as Zaptel?s ?ztdummy? on your Asterisk server. (2) If you are using SIP phones in the same paging group as our speakers and auto-answer is activated for these phones, please upgrade to the latest paging group module in Asterisk, which is 1.2.3 or greater and put an ?x? (this removes auto-answer commands our speakers do not use because they are hard-coded to auto-answer) after the extension number for the speakers in the paging group drop-down menu in FreePBX. What are the Asterisk settings to set up our paging speakers? Please see our CyberData Technical Support Knowledgebase article, Asterisk Settings for Speakers. How do I set up a page group in Asterisk? See the CyberData Technical Support Knowledgebase article, Setting up a Page Group in Asterisk. Are you able to traverse the NAT with your IP paging products? Our IP paging products are programmed to traverse the NAT using Session Border Controllers (SBCs) of the VoIP hosting company or service provider. The SBCs act as an outbound proxy and manage the SIP traffic between the SIP server and the SIP endpoint behind the NAT. Is it possible with one Paging Amplifier to have multiple paging groups? Since the VoIP Paging Amplifier is a single SIP endpoint, it cannot have multiple paging groups. Are the speaker contacts potential-free? Yes, our loudspeaker outputs are potential free. If no paging input occurs, the outputs are at or near zero voltage. What are the output levels of the speaker contacts? The output level is 15 Volt maximum. What 8 ohm speakers are recommended for the Paging Amplifier? My speakers are not loud enough. What should I do? CyberData recommends good quality speaker wire that is 16 gauge and a maximum length of 25 feet. For maximum output, use two 8-Ohm speakers that are wired in parallel with the shortest possible cable length (total combined length should not exceed more than 25 feet). By utilizing the high power jumper settings described in the manual in conjuction with CyberData's PoE Injector, you may achieve additional speaker volume by using either one 8-Ohm speaker or two 8-Ohm speakers in parallel. How do I configure Music-on-Hold (MOH) for Asterisk? Use the instructions at the following link to set up MOH for Asterisk: http://www.voip-info.org/wiki-Asterisk+config+musiconhold.conf. We would like to communicate directly to your products. Do you have any open source programs you can recommend to do this? On an Asterisk-based VoIP SIP PBX system, the CyberData SIP Device status is "Busy" or ?Unreachable. I upgraded my 3CX PBX server to 7.1 and now my Rev B CyberData VoIP IP Speaker and My VoIP Paging Amplifier do not stay registered with the server. There is a 3CX version 7.1 registration / timing bug. To correct this problem, complete the following steps: (1.) Log into the 3CX PBX system, and select SETTINGS -> ADVANCED -> CUSTOM PARAMETERS. (2.) Scroll down to select the NONCEEXPIRATION parameter. (3.) Change the NONCEEXPIRATION value from 1 to 2 and save the changes. When connecting two 8 ohm speakers to the product while in standard low power mode, the unit will reset at full volume pages. The connection of two 8 ohm speakers in parallel under both Standard and High Power Mode require the use of the CyberData PoE injector (010867). How do I connect a 600 Ohm Lo-Z input or output to the V2 Paging Amplifier's Line Input or Output? 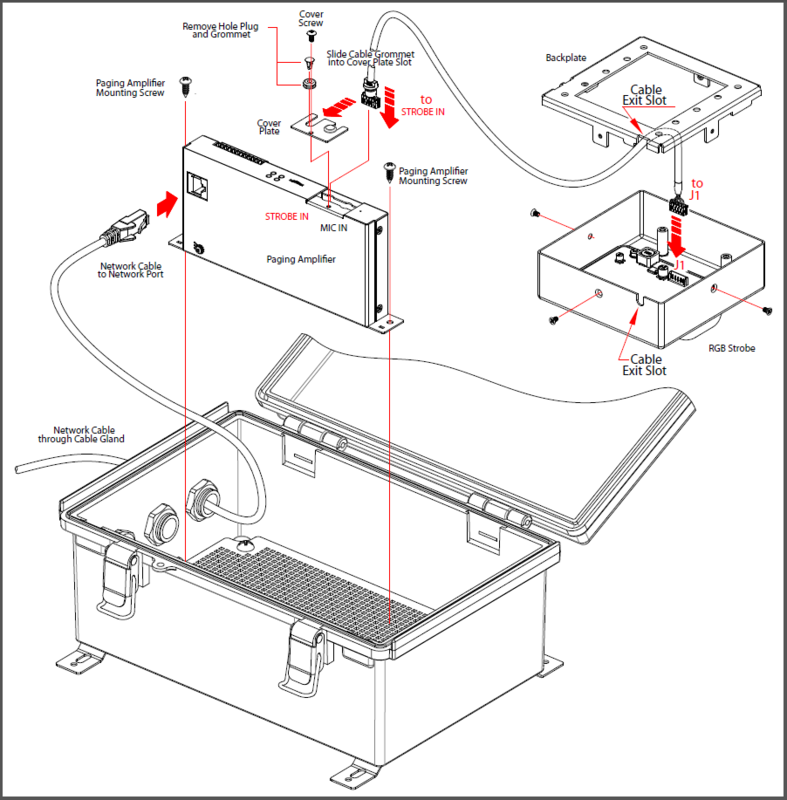 The V2 Paging Amplifier's Line Input and Output can be connected to a 600 Ohm Lo-Z input or output using a Hi-Z to Lo-Z impedance matching transformer. For example, the Bogen WMT1A input matching transformer is an easy to use, inexpensive solution that does not require soldering or complex wiring. We have registered the V2 IP Speaker on Cisco Call Manager but are unable to register the V2 IP Speaker's Nightringer using the V2 IP Speaker's MAC address. How do I configure two extensions on Call Manager for the V2 IP Speaker? I am looking for an approved panic button to connect to your amplifiers that has a cover over the panic button to avoid accidental pressing and also one that may be waterproof for outside use.